This recall involves the DWD110 and DWD112 3/8-inch variable speed reversing drills. The drills are yellow with black accents and have a power cable connected at one end. Only drills with date codes 2017-37-FY through 2018-22-FY are affected. The company initially announced an independent recall in mid-January, but due to the government shutdown it was not officially released by the Consumer Product Safety Commission until Feb 5. 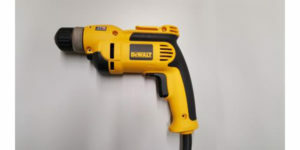 The drills were sold between September 2017 and November 2018 from Home Depot, Lowes and on Amazon.com.